So spooky- I love it! Flickr photo by Artiom Ponkratenko. Trick-or-treating- The businesses in downtown Bellingham will be handing out candy to trick-or-treaters on Saturday from 2 to 5. Fairhaven businesses will be hosting trick-or-treaters on Sunday from 3 to 6. Boo at Bloedel– This is a candy-free Halloween carnival for kids in preschool through second grade. It is held in the multipurpose room at Bloedel Donovan Park. It runs from 4-6pm on Sunday, October 31. The cost is $3 per kid, and adults are free. There will be games and prizes, and everyone is encouraged to wear a costume. Thrillingham– Bellingham’s version of Michael Jackson’s “Thriller,” will be performed at 7:30pm on Sunday, Oct. 31, in the gravel parking lot next to the Village Inn in Fairhaven, 10th Street and Mill Avenue; and at 9pm at Maritime Heritage Park on Holly Street and C Avenue. “The Costume Ball“- At WWU’s Viking Union Multipurpose Room, October 29 from 9pm to 1am. $2 with student ID, $3 without. 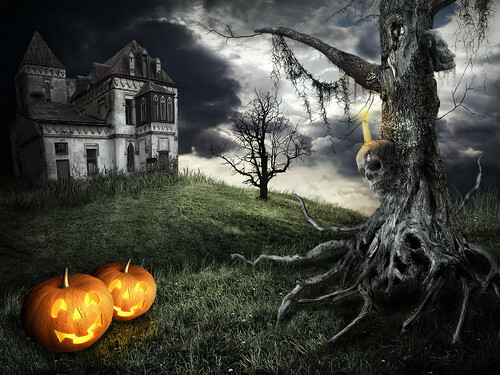 Halloween Haunted Garden– Chuckanut Brewery is hosting a family-friendly party with a costume contest, pumpkin bowling, mummy wrap, bobbing for apples and gypsy fortune-telling from 4 to 6 p.m. Sunday, Oct. 31. What are your plans for the weekend? What are your costumes? I hope everyone has a blast, I know I plan to!